This was one of our most challenging and rewarding hydrotherapy installations. 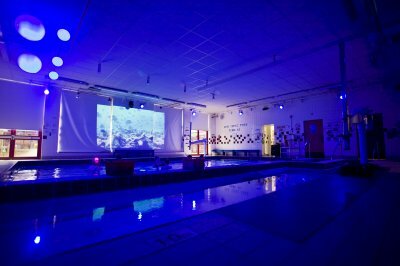 While we were very familiar with the special measures necessary to install sound, lighting and audio-visual equipment in the hot, humid and chemical filled atmosphere of a hydrotherapy pool, this was the first occasion where we had been asked to go beyond our normal field of expertise and also provide a water bubble generation system. The school saw a clear advantage in having a single company responsible for the entire project and Clarity was eager to oblige. After consulting with experts and performing the necessary research on air pumps we were able to confidently proffer proposals for the complete program. Having overcome that obstacle Trinity challenged us further by requesting iPad control of the sound, lighting and projection systems, not just from the poolside but from within the pool itself. 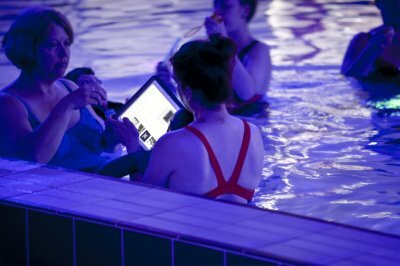 We responded with an iPad in a waterproof case that they can actually use under water. Fortunately we already possessed the skills to develop extremely easy to use Apps to perform the control functions. Furthermore Trinity’s budget did not permit them to have all their desired features from day one. Consequently our proposals took particular care to install systems with sufficient capacity and flexibility so that additional functions, such as lighting effects and alternative sound sources, could be added seamlessly when further funding became available. The very successful bubble generation system uses two independent pumps each producing multiple bubble streams, remotely controlled from either poolside or in-pool iPad. 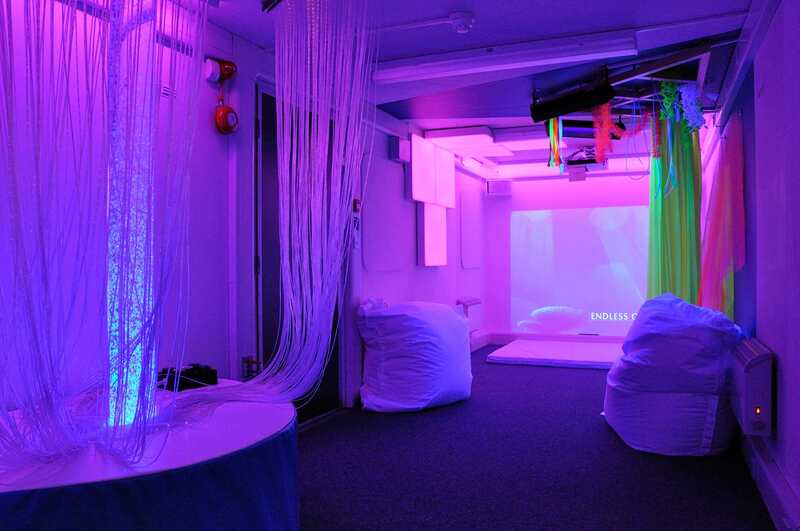 The LED colour (including UV) changing lighting system, lights up all four walls as well as the water if desired. 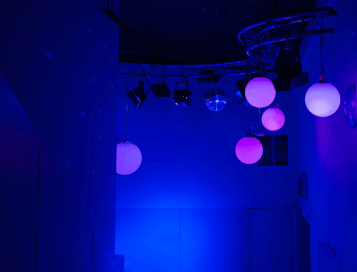 The wall lighting can be selectively switched off when used for video projection, that can be sourced from Blu Ray, AppleTV, Internet, computer, Smartphone, to name but a few. A WiFi booster was included to ensure reliable streaming. 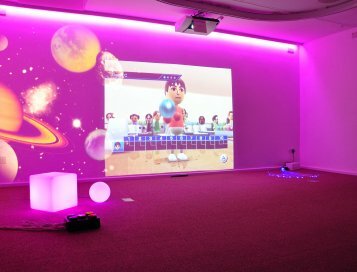 Interactive features include the Optimusic 4 beam system that prompts lighting or sound effects when the beams are either interrupted or strike a floating reflective trigger, LED colour spheres, iPad steerable scanners and other stimuli such as laser beams. An equipment rack stores the sound system, a high quality amplifier, multi-channel mixer, CD/USB/SD/Bluetooth media unit, and radio microphone receivers, all played through high level environmentally protected Bose loudspeakers. For safety and longevity we installed an entirely Ingress Protected (IP rated) electrical infrastructure. It was not possible to source an IP rated projector so we commissioned the manufacture of a special enclosure that sealed the projector in an air-conditioned protective box. The school also purchased a preventative maintenance contract for Clarity to service the installed equipment twice yearly.